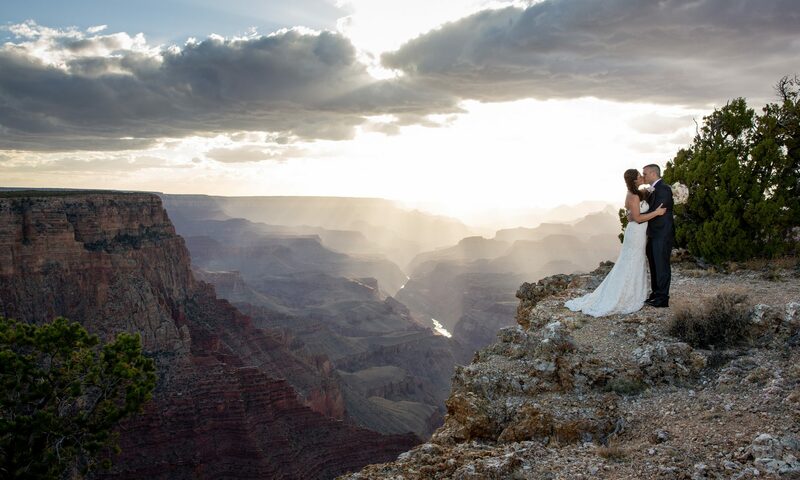 The Destination Wedding Ceremony Package is suitable for groups up to 25 who wish to have an outdoor wedding ceremony only at one of the scenic overlook points within the Grand Canyon National Park. Professional photographer to capture your wedding ceremony, plus approximately 2 hour of newlywed and family photos. Professional editing, digital images and print release included. Sneak peak posted on Social Media within 1 week; all other images delivered electronically in approximately 4-6 weeks. Acoustic guitarist to play on-location for your ceremony and photos, up to 2 hours. Professional, On-Location Hair & Makeup Services are NOT INCLUDED but available as an upgrade to any package. Availability is sometimes limited, so please inquire early. There are no salons in the vicinity of the Grand Canyon.